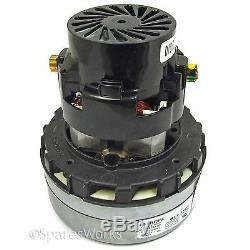 Genuine NUMATIC Vacuum Cleaner 2 Stage Motor (1200W, 110V - 120V). Brand new genuine original complete motor unit for your Numatic vacuum cleaner. 2 Stage DI Bypass 1200W motor suitable for 110V / 120V machines. NUMATIC All models with original motor stamped BL21101... Plus will also fit a wide variety of wet vacuum machines. CT370-2, CT470-2, CT570-2, CT900-2, CTD570-2, CTD900-2, NTD2003-2, NTD750-2, NTD750C-2, NTD750M-2, NTT2003-2, TT6650S, WV370-2, WV380-2, WV470-2, WV570-2, WV900-2, WVD1800AP-2, WVD1800DH-2, WVD1800PH-2, WVD2000-2, WVD2000AP-2, WVD570-2, WVD750T-2, WVD900-2, WVD-900-2... Plus select models of: Henry NRV200 and Henry HVR200. The item "NUMATIC 120V 110V 2 Stage Motor BL21101 1200w Vacuum Cleaner Hoover Motor 205409" is in sale since Monday, August 24, 2015. This item is in the category "Home, Furniture & DIY\Appliances\Ironing & Vacuuming\Vacuum Cleaner Parts". The seller is "sparesworks_uk" and is located in North East England.